In the years since The University of Montana was founded in 1893, it has been an ever-evolving center of progress and change. The campus itself has been a product of that dynamic spirit, constantly growing and morphing to fulfill the needs of the student body and meet the goals of the University. Still, our campus is rich with history, structures and traditions that have stood the test of time. 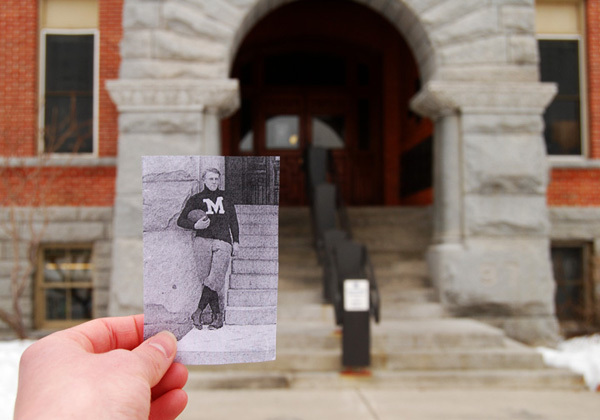 Each of these photos represents but a sliver of the past, but collectively, the images offer a unique perspective on UM’s transformation over the years. This photo of early UM football star Robert Cary was taken in front of Main Hall in 1906, just 13 years after the founding of the University. Alex George and Bobbie Gladowski — members of the sophomore honorary service organizations known as the Bear Paws and the Spurs — lead a campus tour for freshmen and their parents in 1959. 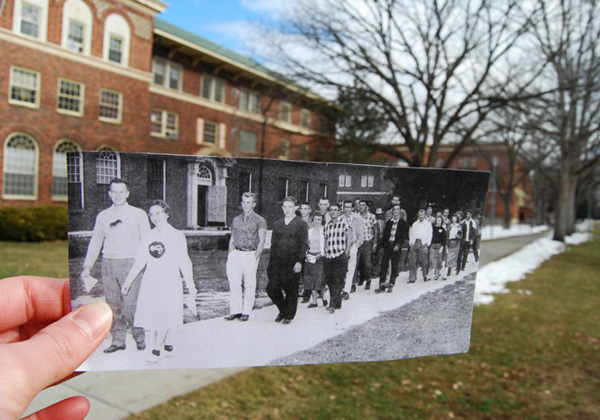 The building in the background is the south side of Brantly Hall — a women’s dormitory that was later converted into offices. 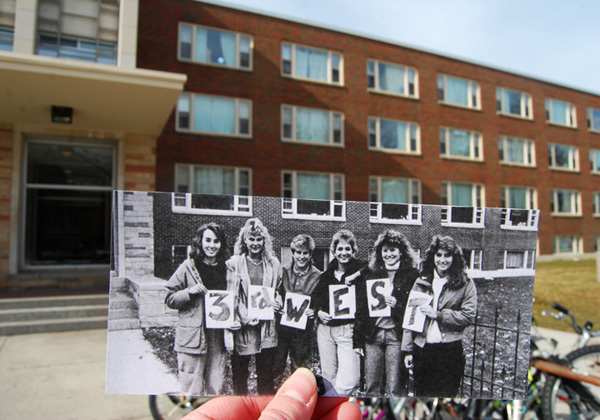 In this photo, Darah Degenhart, Lynette Holum, Tara Thielman, Kelleen DeLong, Sally Zeier and Cheryl Northcutt pose in front of Craig Hall, where they occupied the west wing of third floor during the 1986-1987 school year. 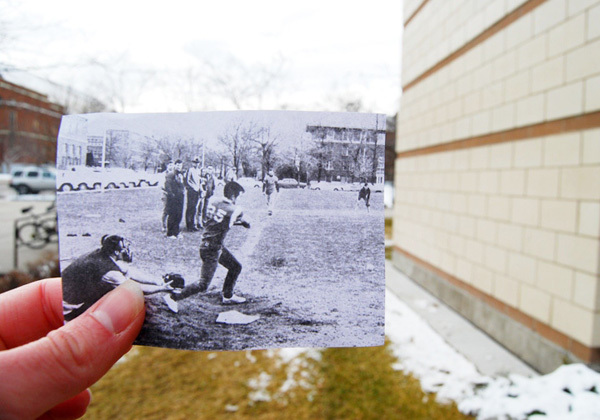 Brett Sine bats the ball as Walt Schone runs for home plate during a 1968 intramural baseball game that took place on a field now occupied by the Gallagher Business Building, which was built in 1996. 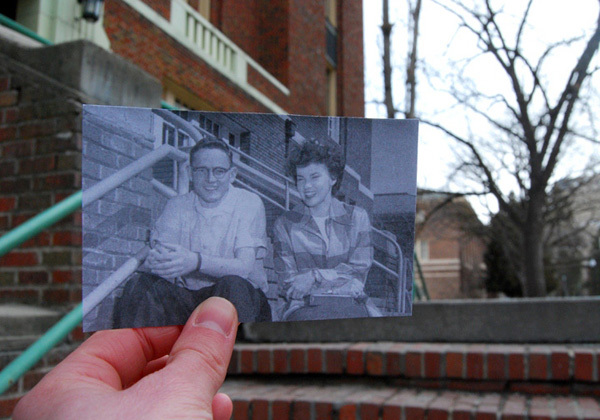 The sophomore class officers for the 1955-1956 school year — president Ted Molthen and treasurer Joan Griffin — pose on the steps of the Student Union, which is now the Fine Arts building. 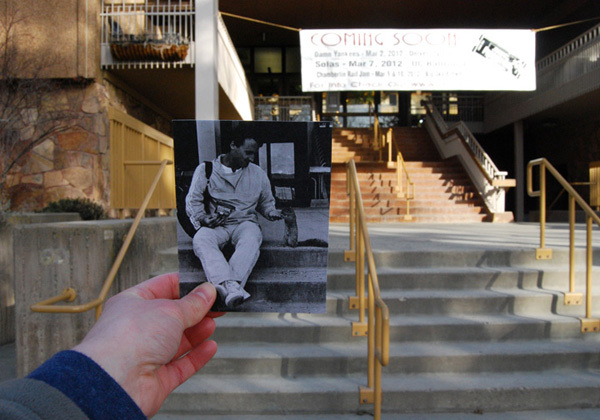 Darrin Davidson makes a furry friend on the steps of the University Center on a spring day in 1989. 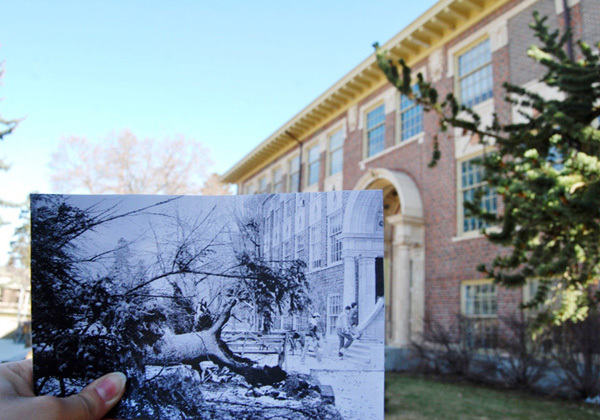 An arctic storm uprooted a tree in front of the forestry building in February of 1989. The University shut down for three days due to high winds and subfreezing temperatures. 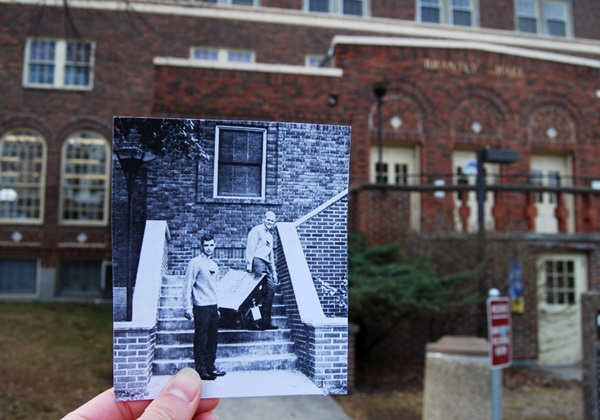 Lee Howard and Gary Libecap — two members of the sophomore honorary service organization known as the Bear Paws — haul a heavy trunk into Brantly Hall during move-in day in 1966. This photo takes us back to the annual spring clean-up tradition known as Aber Day. 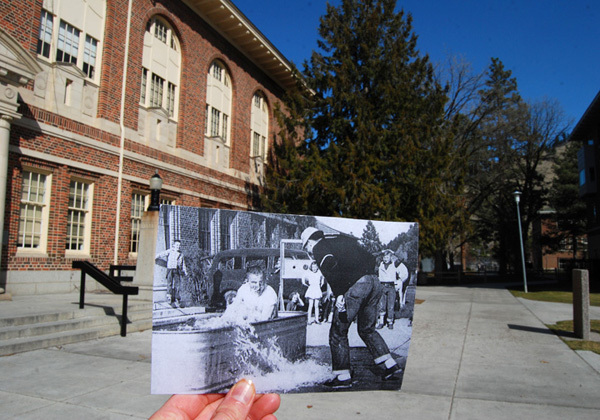 In addition to helping spruce up the campus, students enjoyed food, games and entertainment — including the famous tub-dunkings, shown here in 1952. 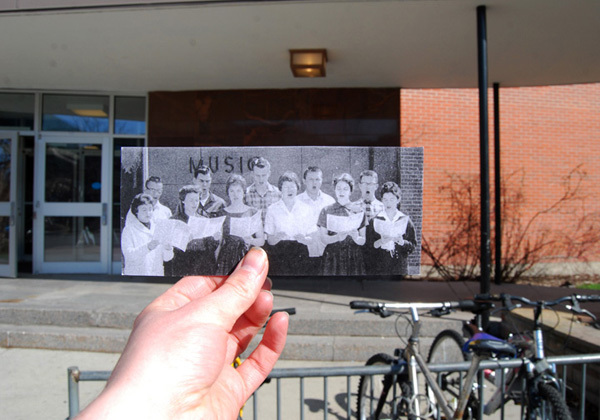 The Madrigal Singers give an outdoor performance on the steps of the Music Building in 1960. 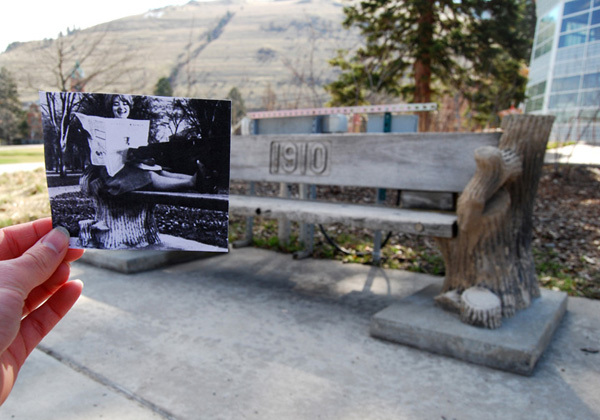 In this 1967 photo, senior Betsy Brown relaxes on the Senior Bench. This familiar campus fixture — which was given to UM by the class of 1910 — was the first recorded gift from a senior class to the University. 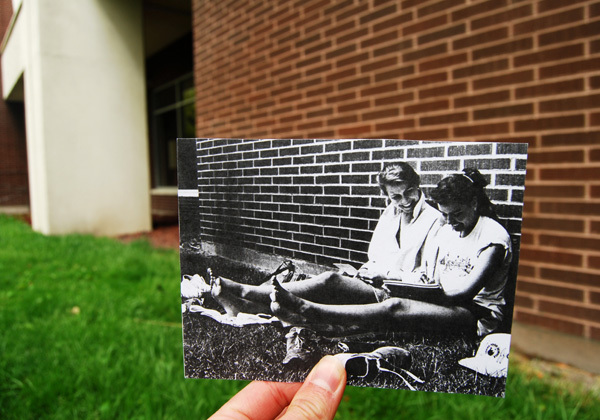 Juniors Andrea Strizich and Lona Carter catch some rays on the south side of Jesse Hall in 1987. 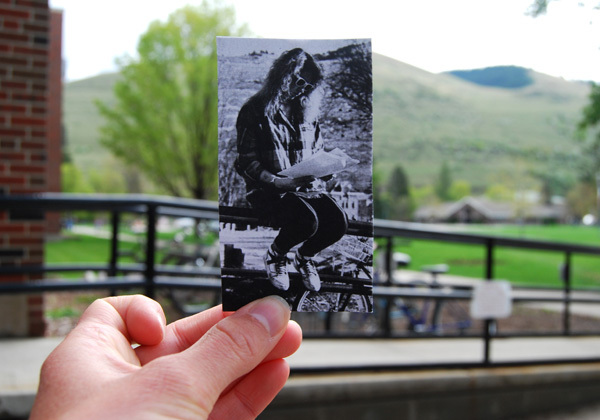 Freshman student Shayne Wood-Garris soaks up some sun while reviewing her notes in between classes in 1989. 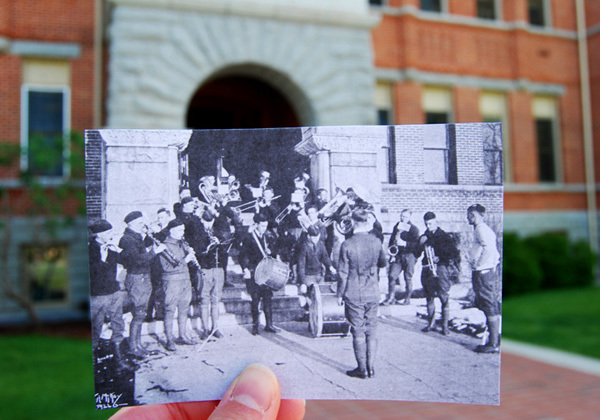 The University Band performs on the steps in front of Main Hall in 1922.